Michael offers intensive and exciting group and private workshops in extraordinary settings year-round. With nearly twenty-five years of experience behind the camera and ten years teaching the medium, his style is one of experience, passion, and inspiration. While the camera and post-production tools are vital pieces of the photographic process, Michael's teachings emphasize strong image content, refined composition, and creativite intent. Philosophical discussions are key components of all his workshops - please come with your questions, ideas, and open mind! Click here for testimonials from many of Michael's satisfied workshop and tour participants. To stay informed of future workshops, tours, and other offerings, please subscribe or stay tuned to this page. Michael's workshops are sponsored by Chamonix View Cameras (workshop participants receive discounts). 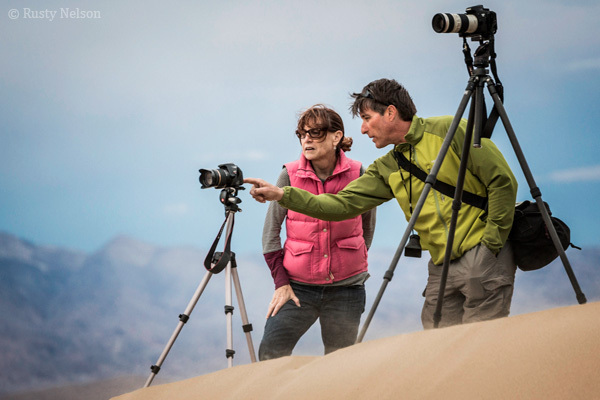 Michael leads private photography tours and workshops into Death Valley National Park October through April of each year. You can choose from one of our established itineraries, or you may customize the tour duration and locations. All private tours include expert location guiding, supplemental technical support and instruction, engaging conversations, unforgettable experiences, and Death Valley's famous star-filled night skies. We also offer by arrangement curbside airport pickups (LAX and LAS only) for those traveling from out-of-state and from abroad. Please click here for more information. This course is currently taught by appointment only (send us an email with your inquiry) and is designed to accommodate all skill levels (including those who have previously worked with large format and have struggled with it). My teaching methods and techniques are direct, uncomplicated, and easy to comprehend. At the completion of this intensive two-day workshop, you will be able to efficiently and confidently compose, focus, meter, and expose your own large format photographs. NO PREVIOUS LARGE FORMAT EXPERIENCE IS REQUIRED! These workshops are sponsored by Chamonix View Cameras, and all workshop participants are eligible for discounts on all Chamonix cameras and accessories. co-led by Guy Tal and Bruce Hucko. Originally conceived as part of the the Moab Photo Symposium, this workshop seeks to help you improve the making of personally meaningful imagery. We all have a vision. We all react and respond to and reflect on our experiences in nature. Refining and sharing our individual vision is lifelong and fun, especially in the company of like-minded people. In this workshop we make images inspired by our internal landscape of thoughts and feelings, with the help of the objects, light and weather of the external landscape. In the formal classroom environment we’ll cover topics of the creative process, the language of art, visualization and composition, Adobe Lightroom and Photoshop techniques, photographing and processing for B&W and other technical considerations. We’ll also have special sessions on portfolio development, preparing images for web and print and writing about our work. Please click here for more information and to register. September 21-22, 2019: Creative Nature and Landscape Photography: Concept, Capture, and Process San Juan Mountains, Colorado. Nature and landscape photography transcends "pretty postcards" when made by creatively engaged photographers who understand their motivations, subjects, and tools. My goal is to provide you with the inspiration, knowledge, and hands-on learning to help advance your creativity and photography skills with an emphasis on nature and landscape photography. This workshop is suitable for all experience levels and offers a unique blend of philosophy, field work, and classroom instruction in beautiful settings. We'll cover photographic fundamentals; precision exposure and capture; image aesthetics; special tips and techniques; and conclude with an overview of post-processing basics using both Adobe Lightroom and Adobe Photoshop. Click here for more information and registration. Death Valley National Park, California. Limited to 10 photographers. Internationally acclaimed photographers and workshop leaders Guy Tal and Michael Gordon have carefully selected some of the park’s most unique locations for this workshop, which combines outstanding photography with inspirational, creative and technical discussion sessions. Find out what makes this workshop unique, passion-filled, and inspiring to photographers of all levels. A perfect blend of photography, field classes, post-production, and passionate photographer/instructors all in one of the most visually stunning places on Earth has earned this workshop praise as "a tour de force of excellence, humanity, artistry, and knowledge". Please click here for more information and to register. Michael is pleased to offer private photography workshops and tours for one or more persons. Workshops are focused on learning, skills, and camera techniques. Tours are ideal for experienced photographers who want to be in the right place at the right time. Private tours may include technical instruction upon request. ALL instruction and lesson plans are custom-tailored to your interests, skill and fitness levels, and camera format. Tour locations and itineraries are planned with your direct input. More ground can be covered in private tours than is typically possible in group workshops. 100% of Michael's attention is focused on you alone. The workshop/tour pace can be intensive or relaxed - it's all your choice. Please contact Michael by email or telephone to discuss availability and rates. Please contact Michael by email or telephone to discuss availability and rates. • Fine art exhibition printing: Michael creates exhibition-quality fine-art prints from your film and digital originals. Includes all necessary and creative darkroom manipulation of your image: color balance; global and local contrast control; burning and dodging; cloning/spotting, sharpening. For optimum output and accuracy, all color prints are made with Michael’s own custom RGB printer/paper profiles, and all monochrome prints are made with the beautfiul Piezography K7 Sepia carbon pigment inkset. Proof prints, exhibition prints, CD burning, and shipping charges are additional. Michael's consultation rate is $75 per hour (billed in 1/2 hour increments). Please contact him via email or telephone (562/201-0856) for for additional details and booking. Please contact Michael via email or telephone (562/201-0856) for Instruction, Tours, Consultation, and Fine Art Printing availability and rates.